The CoverCat 302 has been designed specifically for use where access doors or walkways is required. Also used on roof areas and on sites where rough ground is common. The unit is intended mainly for single gun application of a range of low to high solids plural component materials. 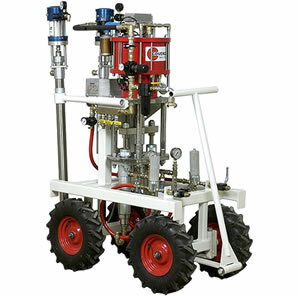 It can be used with a remote mix manifold and hose extensions for fast cure materials including Epoxy, Polyurethane and Polyurea coatings.